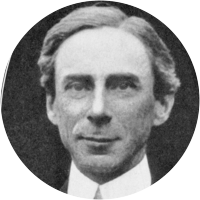 A collection of the best Bertrand Russell quotations. Most people would sooner die than think, and often do. — Bertrand Russell Am I An Atheist or An Agnostic? Human life, its growth, its hopes, fears, loves, et cetera, are the result of accidents. The average man's opinions are much less foolish than they would be if he thought for himself. It is only intellect that keeps me sane; perhaps this makes me overvalue intellect against feeling. Mathematics possesses not only truth but supreme beauty—a beauty cold and austere, like that of a sculpture. I can only say that, while my own opinions as to ethics do not satisfy me, other people's satisfy me still less. True happiness for human beings is possible only to those who develop their godlike potentialities to the utmost. Rules of conduct, whatever they may be, are not sufficient to produce good results unless the ends sought are good. Heretical views arise when the truth is uncertain, and it is only when the truth is uncertain that censorship is invoked. If rational men cooperated and used their scientific knowledge to the full, they could now secure the economic welfare of all. A sense of duty is useful in work, but offensive in personal relations. People wish to be liked, not to be endured with patient resignation. To preserve hope in our world makes calls upon our intelligence and our energy. In those who despair it is frequently the energy that is lacking. He thought of civilized...human life as a dangerous walk on a thin crust of barely cooled lava which at any moment might break and let the unwary sink into fiery depths. The widespread interest in gossip is inspired, not by a love of knowledge but by malice: no one gossips about other people's secret virtues, but only about their secret vices. Even if the open windows of science at first make us shiver after the cozy indoor warmth of traditional humanizing myths, in the end the fresh air brings vigour, and the great spaces have a splendour of their own. As soon as we abandon our own reason, and are content to rely on authority, there is no end to our trouble. Whose authority? The Old Testament? The Koran? In practice people choose the parts they like, ignoring the others. The opinions that are held with passion are always those for which no good ground exists; indeed the passion is the measure of the holder's lack of rational conviction. Opinions in politics and religion are almost always held passionately. Mathematics rightly viewed, possesses not only truth, but supreme beauty—a beauty cold and austere, like that of sculpture, without appeal to any part of our weaker nature, without the gorgeous trappings of painting or music, yet sublimely pure, and capable of a stern perfection such as only the greatest art can show. Although tact is a virtue, it is very closely allied to certain vices; the line between tact and hypocrisy is a very narrow one. I think the distinction comes in the motive: when it is kindliness that makes us wish to please, our tact is the right sort; when it is fear of offending, or desire to obtain some advantage by flattery, our tact is apt to be of a less amiable kind.